The essence of vinyasa is to move with the breath, to move in sync with the flow of life. When we are living in flow, there is natural ease and grace that arises as we give witness to the cyclical quality of all things. To glow from the inside out is to live in harmony with the natural cycles, we can then experience harmony on all levels, physically, mentally, emotionally and energetically. These transformational video practices and lifestyle guides are specifically crafted to help you harmonise with the seasonal changes to enjoy optimal vitality and mega radiance! 4 x full-length yoga practices: I have lovingly created these well rounded video practises for you to enjoy at home, on holidays, outdoors. Each of the four vinyasa flow practices include pranayama (breath work) and meditation and run for approximately one hour. They are specifically designed to balance the elements of each season. 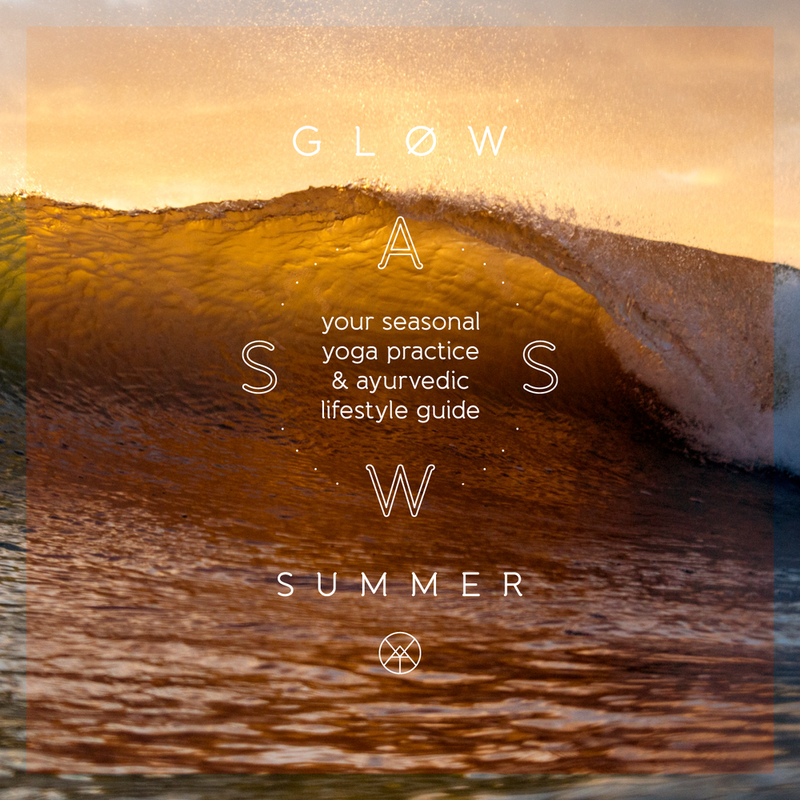 ayurvedic lifestyle guide: The seasonal Ayurvedic lifestyle guides is your beginners toolkit to integrating Ayurvedic practises into your daily flow. Ayurveda is the sister science to yoga, its a traditional medicine system that focuses on balancing the body and mind with diet, herbs and relaxing and cleansing treatments like massage. glow game-plan: You will also find your bonus (printable) glow game-plan. This is the practical map to getting the most out of your glow package. It will take your practice and intentions for each cycle to the next level and ensure that you feel radiant, alive and vital through each cycle. The timeline you choose to work with should serve YOU. It might be a week, a month, 3 months use this program to discover and honour your own rhythm. The more consistent you can be with your yoga sadhana (self-study) the easier it is to stay 'plugged in' to the natural flow. To be connected to your body, intuition, heart and relationships, I want you to experience that kind of aliveness. Once you have made your purchase you will receive an email containing a link for you to download you GLOW package. You will find all your videos and Ayurvedic lifestyle guide right there. You can download GLOW and there is no limit to how often you practice! whats the best way to use glow? The luxury of being able to practice at a time and place that fits your schedule means that practising on the daily is a cinch! Once you have saved your video you can use it anytime, I recommend getting on your mat first thing in the morning, otherwise choose a dedicated time of day for your practice. The information shared in your lifestyle guide can be integrated into your daily rhythm, make time at the beginning of each month to reflect and meditate upon your intentions, commitments and seed dreams. Is GLOW suitable for beginners? Each of these sequences work in stages, so you will always have an option that feels appropriate and accessible, as well as having room to grow and evolve your practice when the time is right. As always, it's essential that you listen to your body and respect it's intelligence, rest when you need to and enjoy discovering your edge. We would love to know what you think, get in touch if you have any feedback! What if i cant download? Sometimes tech stuff is a trickster so if you do encounter any problems with your email or downloads all you need to do is contact me directly via phone or email. Can I get a DVD?